As is self-evident – and described elsewhere on the CSM website – extracting meaning and, especially insight can be very demanding from an intellectual and, possibly a statistical point of view. There then comes to problem of communicating it in a digestible and informative manner. 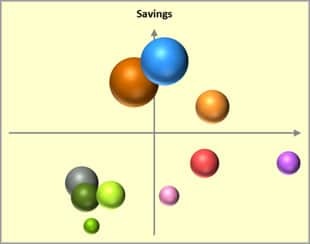 There is an anecdote from the Tesco board related to the early days of their loyalty card: after two weeks of study their external consultants – the data analysts (dunnhumby) presented to the Tesco Board and were told that ‘in two weeks, they knew more about the business than the Board knew after many years of operational responsibility’. Note: we have also had this feedback from a customer that wasn’t altogether pleased! Sometimes, data analytics leads to a level of objectivity that isn’t very welcome! The point we would wish to make is that the best data analytics in the world are of little-to-no value unless the results are packaged and delivered in an understandable way. There are many tools on the market – in addition to the ubiquitous PowerPoint – to communicate both complex and fast-moving data effectively. Perhaps more difficult – and we are sure that this will change – is to extract meaning and communicate the significance of the new forms of data. 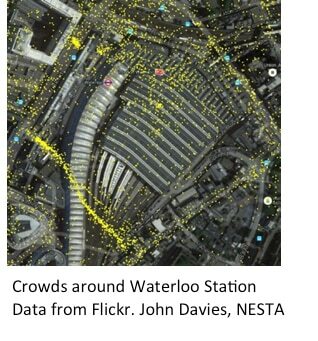 See, for example, the plot of crowds around Waterloo Station. N.B. These are just people who had uploaded images to Flickr in real-time. In an abstract context, an image of this type just has interest value but, perhaps in terms of urban planning, this could be extremely valuable. So the key is to embed such information in a narrative that leads the recipients to the result. And it is our experience that this skill is vital as a complement to the skilled statisticians and analysts who have produced the data. The tools exist but it is how they are used that matters!